Despite being a huge fan of Queen I have only recently watched this film. It is one I have looked forward to watching and one which to review, will be coloured, I know by my fandom. But not in a way you’d perhaps expect. Firstly, it has to be highlighted that some of the performances in the film are excellent. Given the roles they’ve been asked to portray the actors have taken what they’ve been expected and brought those characters to life. In the musical sequences, both live and studio, there is a believe that the viewer is experiencing Queen. Okay, no one will expect the sheer brilliance of the band to be 100% there and for certain, it would be impossible to purvey the sheer magnetism of the greatest frontman of them all, Freddie Mercury. But more of that later. The second point to make is that the performances and the film itself is remarkable given the issues and time taken to bring the project to fruition. Original director Bryan Singer leaving before the film was completed and being replaced by the uncredited Dexter Fletcher could have meant the film ended up as disjointed mish mash; it is to Fletcher’s credit that he completed the film seamlessly. Add to that the issues with the original choice to play Mercury, Sacha Baron Cohen, leaving because of the portrayal he was expected to give, and the film makers could have been forgiven for giving up on the project. The film is, obviously, a project of love, driven by Queen band member’s Brian May and Roger Taylor. And this is, perhaps, where the issues begin to lie for me. The issues do start quite innocuously to be fair, with a chronology that is no more than grating to the fan, but still to me it did mean checking the internet through out the film to make sure I hadn’t got things wrong. One example being the story jumping to 1980 before we see a scene with the band creating ‘We Will Rock You’ in the studio, a song released three years earlier on the ‘News Of The World’ album. Now I’m fully aware that I am firmly sat in pedant’s corner and that for people coming to the film from a less fan based viewpoint it won’t be as much an issue (and to be fair to tell 15 years of history in 2 hours is no mean feat). But still, to me, it was an issue. Though an issue it wasn’t one that was going to spoil the film, but for three major issues that did really cause problems for this viewer. The issue’s do stem from the fact that this is very much May’s and Taylor’s view of the history of Queen the band. And whilst they will have felt that they have been honest in their appraisal, and have shown the band at both their best and worst, and indeed have been upfront about the relationship’s between themselves, the band management and the various hangers on, they have still been selective in what they have presented. The thing about Queen, and something they do touch on in scenes with the EMI management, is that did do things their own way, they didn’t tow the rock party line. But that did mean they did some stuff that wasn’t great. In the early 1980’s I was starting secondary school where I became exposed to rock music, but I also became exposed to a different type of political viewpoint with the biggest world issue being the apartheid of South Africa. Major artistes refused to tour there with the motto being ‘I don’t Play Sun City’, but Queen did. And whilst they never ever claimed to be a political band, and indeed completely disinterested in being anything but a rock band, for many music fans their ‘disregard’ for that issue made them ‘persona non gratis.’ And it most certainly contributed to their story and for why they were, before their redemptive appearance at Live Aid, a band much derided and even despised, something that must have been central to the way they all interacted with each other. To not even mention it in passing, being as it was so important, seems remiss and can only be borne from a desire, one must assume, to perhaps present a sanitised view of themselves as a band. 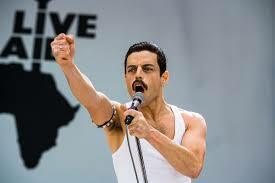 To Live Aid which serves as the culmination of the film, the moment of Queen’s great redemption and indeed the moment that Freddie began to cement his reputation as the greatest frontman of all time. The whole build up in the film was evocative and brilliantly done with the use of original footage of the crowd bringing home the sheer amazing nature of the day. Queen, on that day, were awesome; for all who witnessed it, either in Wembley or on the TV coverage, one of the highlights, a performance to be remembered for the rest of times. But, it was, albeit one of the greatest, one of many great performances; Live Aid was Bob Geldof’s moment, it was his drive and determination that got the concert off the ground and which brought the money in. This film paid scant regard for that contribution and does, for me, make too much of Queen’s influence on that day. That’s not to say the film shouldn’t have finished with a recreation of a live performance; but for me that performance would have been Knebworth on the Live Magic tour, a day in which 250,000 plus people went to see Queen, just Queen, and in their adoration truly gave Queen the redemptive moment of magic their career so richly deserved. In my opening comments I mentioned the performance of Remi Malek as Freddie Mercury and said that he’d done a remarkable performance with what he had been given to do. But this is another problem. Taking away from the emotion about how close he got to Freddie on stage, which one is hell of a task to achieve, and one that which he made an admirable attempt at, how close was he to Freddie the person? This is important as lets be honest, as the film made clear on more than one occasion, despite the band being four people Queen were intrinsically linked with Freddie Mercury. There is no doubt Freddie would have been a star somehow. But also there is no doubt that without Freddie, Brian, Roger and John Deacon would probably be now not in the music business and would just be a footnote in the history of music (something, to the credit of all three, they are more than happy to admit.) Queen’s story is essentially Freddie’s story. A story I feel wasn’t entirely told by the film. Freddie was a hugely conflicted character. Often vulnerable, in need of love, over confident as a tool to combat his shyness. All aspects of his character that was brought to the film. But he was also wildly promiscuous, naughty, controlling, egotistical and, on occasion, horrid. All things the film, I feel, did it’s best to hide or swerve around. And this is the biggest problem with the film as a whole. This is Freddie’s story presented as the PG version, when we all know Freddie lived an X rated existence, and existence that contributed to both who he was and his early demise at the age of 45. 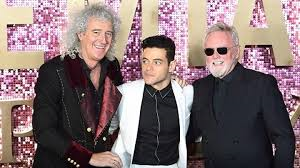 The problem I think is that the film makers, and in particular May and Taylor, are preoccupied in protecting the image and legacy of Queen and Freddie Mercury. In doing so, they have misunderstood and therefore, unintentionally, insulted the intelligence of many of us and underestimated the love we have for Freddie Mercury. We know what Freddie was and it doesn’t matter. There is no need to hide it away from sight, no need to gloss over the ‘sordid’ details. If we can accept Freddie at his best trust us that we can accept him at his worst (if worst is the right word, after all his worst is only worst by the standards of the press and media who so hounded him.) If nothing else Freddie stood up proud and stuck a proverbial two fingers up to those who wished to drag him down. Ironically, in trying to protect Freddie, I think the reverse has happened, the real Freddie has been hidden away, and that is to his detriment and the films. Ultimately, I feel the film falls between two stools and in doing so becomes less of a film for it. It’s not to say it isn’t enjoyable and certainly for fans of Queen’s music it brings back wonderful nostalgic memories, an insight into how they created that amazing music and has a wonderful feel good nature. Which would be fine were this film just aimed at that market. However, in adding the story of Freddie, but only the parts the filmmakers and producers were comfortable with, the film has been diminished. Which is a shame as the Freddie story is a story that deserves to be told, in all it’s honesty and would be respected by fans and film goers alike.